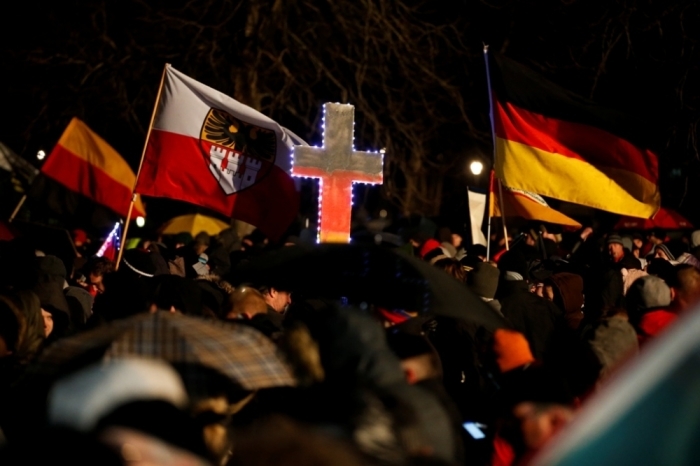 The anti-Islamisation movement Pegida gathered record numbers of people in rallies this week in Germany, following the terror attacks in France that left 17 people dead. Larger counter-demonstrations for unity have accused the movement of harboring anti-immigrant xenophobia, however, and some asylum-seekers have spoken out about fears for their safety. The Independent reported on Wednesday that a record 25,000 Pegida supporters gathered in Dresden, while more anti-Islamisation rallies are scheduled for Cologne. The campaign has spoken out against mass immigration into Germany, particularly by people coming from Muslim countries, who Pegida says are changing the country's culture and having a negative effect on society. The terror attacks carried out in Paris last week by Islamic extremists who targeted satirical newspaper Charlie Hebdo for publishing cartoons of the Muslim prophet Muhammad have escalated tensions to a notable high. Germany's politicians, including Chancellor Angela Merkel, have condemned Pegida and said that its members "have hatred in their hearts." Counter-rallies in solidarity with Muslims and focused on unity in Germany have drawn larger crowds, and on Monday close to 100,000 people across the country took part in demonstrations to condemn intolerance and stand with the victims in France. With reports coming out that a 20-year-old asylum-seeker from Eritrea is suspected to have been murdered in Dreseden, some refugees have spoken out about fears for their safety. The city's Morgenpost newspaper revealed that the victim, Kahlid I., lived in an apartment block with 20 other asylum-seekers. "People treat us like enemies, there is hate in their eyes, we don't dare go out, we need protection," one of the asylum-seekers said. Pegida organizer Kathrin Oertel has argued that Germany's politicians are failing the citizens of the country with their bad policies, however. "Or how would you see it when we are insulted or called racists or Nazis openly by all the political mainstream parties and media for our justified criticism of Germany's asylum seeker policies and the non-existent immigration policy," Oertel told the crowd in Dresden last week. The movement was started in October 2014 by Lutz Bachmann, who runs a public relations agency in Dresden. "The terrible acts of Paris are further proof that PEGIDA is needed," Bachmann said, reflecting on the recent events. German officials have said that the group is exploiting the tragedy in France to stir up hatred, CBC News reported. "What we need to do now is to use all the means at our disposal as a constitutional state to combat intolerance and violence," Merkel said in Berlin. "To exclude groups of people because of their faith, this isn't worthy of the free state in which we live. It isn't compatible with our essential values. And its humanly reprehensible," she said. German President Joachim Gauck agreed with Merkel, and vowed that Germany wouldn't allow itself to be split by extremists. "We stand against any form of demonization and ostracism," said Gauck.